Trolley Five100 is the ideal solution for immediate suppression of class A and B fires, characterized by the high risk of propagation. 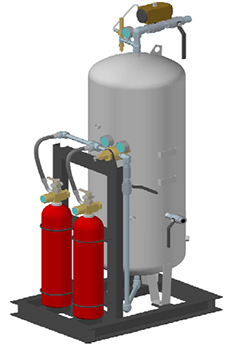 It is a mobile system composed by a manually activated tank containing water mixed with FireFive® and a nitrogen cylinder. Fire hose is tailored made, available in different sizes. FireFive® empowers the suppression effect of water and enables its use on class D fires’ applications which is normally discouraged, in order to avoid possible reactions such as explosions in the case of metal fires. Moreover, the immediate cooling effect of FireFive® inhibits the re-ignition of flames which is a crucial aspect for this class of fires. 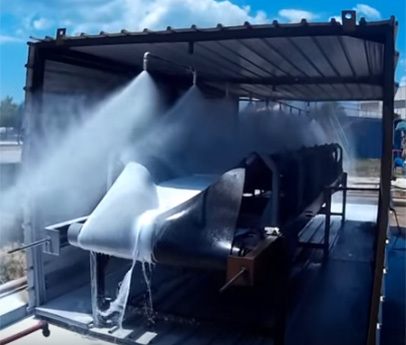 The most effective strategy to fight hydrocarbon fires is to use the combined action of the wetting agent FireFive® and a AFFF film forming foam. Firstly, you discharge on the flames the FireFive® agent, benefiting from its maximum cooling effect. Once the fire is suppressed, you can apply the AFFF foam in order to avoid hydrocarbon spill over. 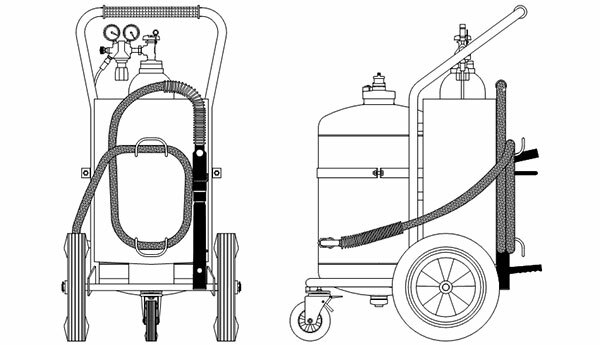 Trolley Five Double is a mobile equipment which allows to fight a fire using the combined action of FireFive® and AFFF foam, storing them into two separate tanks, guaranteeing the highest performance in the shortest time. 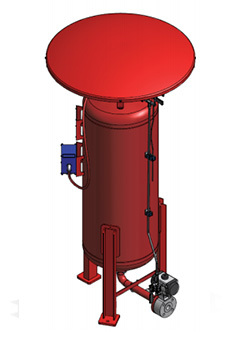 CB Five 200 is our modular Low pressure Water mist system, engineered for the fire protection of conveyor belts. The system is 100% eco-friendly and RINA certified. Rim Seal F is an automatic rim seal fire fighting system engineered for the protection of the floating roof tanks in high risk industrial applications. The entire Rim Seal F mechanism is automatic. The extinguishing agent is stored in a 250 litres tank and it is composed by a water and FireFive® mixing solution which is maintainedconstantly pressurized thanks to the action of the integrated pneumatic detection tubing. In case of detecting a fire the detection tube breaks and causes a loose of pressure, acting directly on the actuator which immediately discharges the extinguishing agent. Rim Seal F discharges the mixing solution through special nozzles located on the rim seal area, generating an elliptical jet. With nozzles spaced one from each other to max 2,5 metres, the system can cover an area up to 40 metres. Rim Seal F is fully equipped, provided of a stainless steel canopy, it can also be configured with ATEX components for hazardous areas. Rim Seal F can be integrated with any fire detection system available on the market. 100% compatible with PLCs’ sensors, it can be monitored on site or by remote control. Power T Five is a Water mist system developed for the fire protection of electric oil transformers, widely used in industrial plants. In these applications the high fire risk is due to the presence of the oil contained into the transformers. The traditional fire fighting uses to propose as fire solution the deluge system whose operation requires a big quantity of water reservoir. On the contrary, Power T Five is an innovative solution which adopts the Water mist technology, able to produce as extinguishing agent nebulized water mixed with FireFive®. Powered by dedicated cylinder skids, Power T Five can also work as Stand alone solution. It is an independent system with no need of power supply, allowing the best performance even in case of system breakdown. 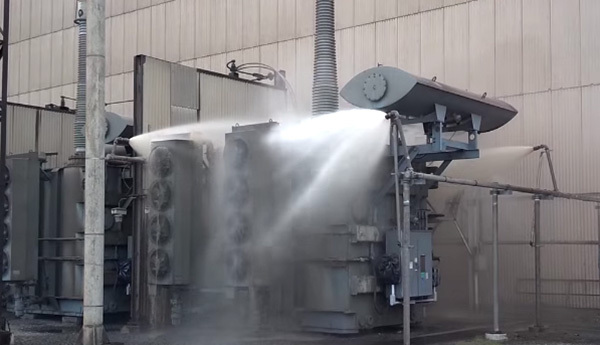 The nozzles used, specifically engineered for this application and located in order to cover completely the affected area, allow an immediate cool down of the surface and a rapid control of the flames. The heat sensitive cables placed on the transformer detect the fire assuring the system intervention in few seconds. Furthermore, the system can be integrated with electrical control panels able to receive from the control room the alarm signal generated by the transformer Bucholz relay. If you need more info or a quotation, please contact us. We will be happy to help you.